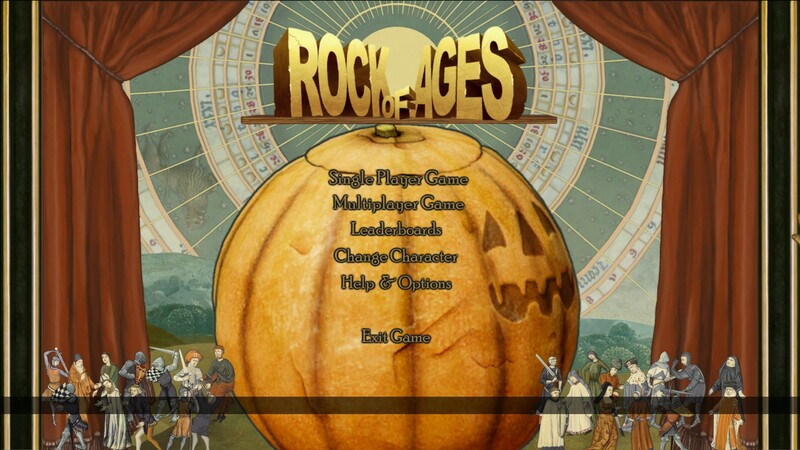 I played Rock of Ages around Halloween, so the pumpkin in the background was a nice touch. I recently bought Rock of Ages after years of seeing journalists giving it praise for being random, yet successful for such a small studio. I knew it was a physics based game, where you control a ball and destroy levels, but nothing could have prepared me for the craziness that ensued. Rock of Ages starts out with a cutscene comprised of old portraits from history, and tells the story of Sisyphus snapping after constantly pushing his rock up a hill for it to fail many times. He decides to take on the other gods and notable heroes of history, and so begins your campaign through this weird and wonderful world. Each level is comprised of a tower defence style set up, with the ability to then control your ball to defeat your enemy. The enemy is doing the same as yourself, which means you have to spend most of your time avoiding his traps and enemy placements to ensure you get to his keep and squash him inside. It’s a brilliant play style, one that mixes up action and strategy in a new and interesting way. The game I would liken this too would be Sanctum, where you build your placements before battling in the next wave of attacks. It’s fun and addictive, but can lead to issues when you’ve been fighting for over 10 minutes and you suddenly lose, it feels like a time waste, and one that could have been avoided with some quick saves throughout matches. The strategy element is key to being successful in a match, meaning you can’t rely on your boulder all the time. I found myself struggling through many levels because I didn’t invest into my defence enough and just concentrated on attacking, a silly mistake that I warn you not to repeat. You will need boulder skills, don’t get me wrong, but they’re not entirely needed to win a match, as long as you have your defences, it’s plain sailing. Boss battle’s are dispersed throughout the main campaign, allowing for some variety in an otherwise repetitive story mode. Each Boss is unique, but entails hitting the same weak spots over and over until they fall. The campaign comprimises of many of these encounters with historical characters, but occasionally you come across something special and unique, a boss battle. These battles are different each time, but have the same end objective: To kill the boss. This is done through hitting the boss figure in weakspots located all over their body, for the dragon: its underbelly, for the greek statue: its groin area. These become repetitive in time, but Rock of Ages ends its campaign at just the right time, when you’re at the point that if you played anymore you’d hate the game, but any less and you’d feel let down. Your boulder can be changed during a game, allowing you to change your game style on the fly, or counter enemy tactics. In this instance, my boulder is stronger, allowing it to take more damage, whilst also causing more damage to the opposing player. 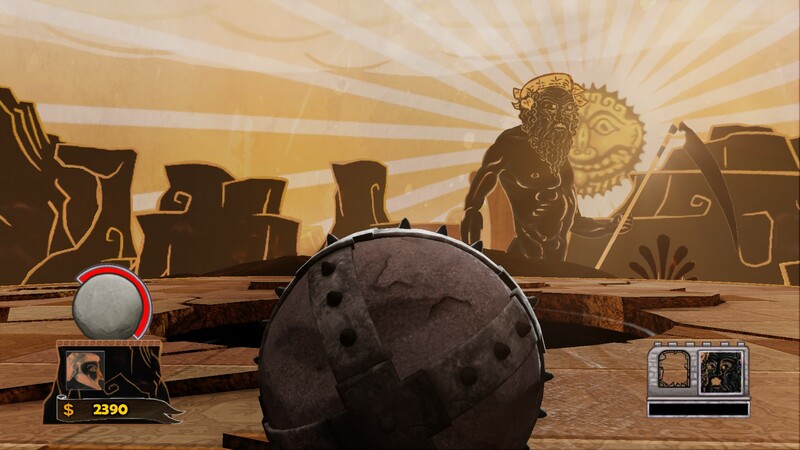 Cutscenes are plentiful, happening between each level and explaining Sisyphus’ journey across Europe and through history. They’re comical and brilliantly executed, leading to myself laughing out so loud that family members came in to see what all the noise was about. 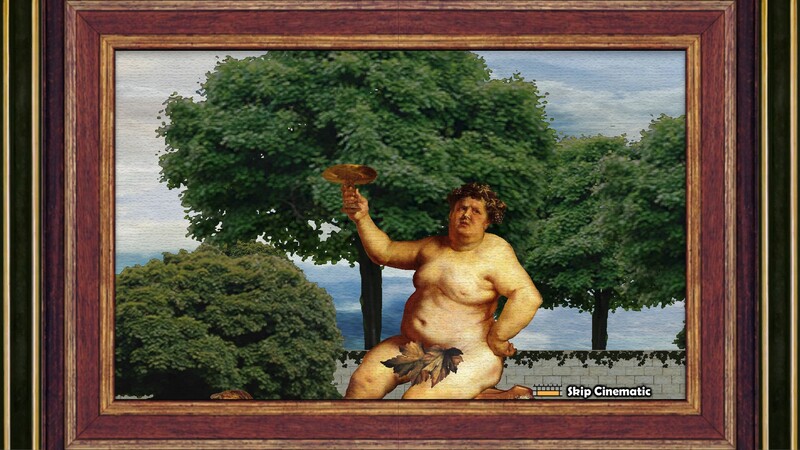 Each cut scene is made using real world art, from historic paintings to photos, each character is lovingly animated to give them a personality that’s likable, or hatable, depending on the scenario. Graphics is stunning, making for some truly smooth and brilliant looking levels and action. The whole game is based around physics (Nvidia PhysX to be precise), and makes good use of smooth Anti Aliasing with Ambient Occlusion to make a seemingly lovely environment with attention to detail. The levels are crafted in a sensible way, giving the aesthetics of the time they’re taking place in, whilst lovingly adding some charm and humour. With 2D character and crowds shouting your rock onwards, its relatively funny and makes for an enjoyable experience, one that’s refreshing and rather original in todays realistic approach. Thinking about it, the aesthetics reminded me of Monty Python, with 2D characters blended in with realistic environments, I wouldn’t be surprised if I one day find out they were inspired by the same art. 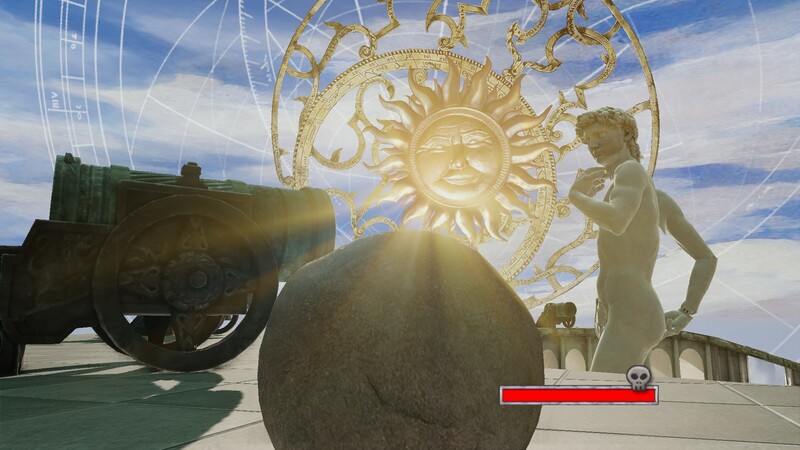 Cutscenes comprise of artistic depictions of characters of history put in strange and funny situations. I was surprised by how much of the campaign I genuinely found funny, and wasn’t laughing out of embarrassment for the developers, like most other humorous games these days. The music to Rock of Ages is lovely, blending classical music with a modern take, but can get a bit tedious and annoying when you have to repeat levels. It certainly leaves an impression on you, meaning I got excited whenever I booted up the game and listened to it’s main theme at the title screen, but would be filled with contempt if I even began to hear a track from a level I’d had to repeat time and time again. Overall, I thoroughly enjoyed my time with Rock of Ages. It’s definitely not going to be for everybody, and I certainly had times when I wanted to stop playing due to retrying a 10 minute battle 3 times in a row, but stick with it and the outcome is worth the pain and trouble. It’s rare for me to feel that way about a game, I’m currently playing through Dishonored and cannot for the life of me find the passion to carry on, but with Rock of Ages, with its witty humour and refreshingly original gameplay, I feel the 4-5 hour campaign is worth it. You’ll certainly respect the developers for it, and it may even entice you enough to play its multiplayer.